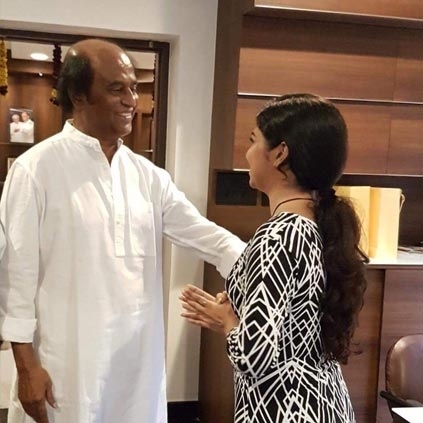 Popular dubbing artist Raveena met Superstar Rajinikanth recently at his residence. She shared few clicks from the meet in her Twitter handle today (3rd Nov) and she now happens to trend as those photos have already gone viral. Behindwoods got in touch with Raveena and this is what she had to say, “My uncle who is from Dubai was very much interested to meet Rajini sir and that is when we got in touch with a source close to him who eventually arranged this meeting. I have heard people tell me that Rajini sir does not talk much but after meeting him I could still not imagine how a person of that caliber can be so humble. My ‘paatti’ was a dubbing artist those days and we met him a long time ago when I was a kid. We showed Rajini sir that picture and he immediately recognized it and said ‘AVM la eduthadhu dhanae idhu’. I told him that I would wish to tell people that I am a part of Thalaivar’s film, for which with his usual smile Rajini sir told me ‘solliko solliko’. It was a special day indeed!" People looking for online information on Rajinikanth, Raveena, Superstar will find this news story useful.